What Is the Shelf Life of Sun-Dried Tomatoes? 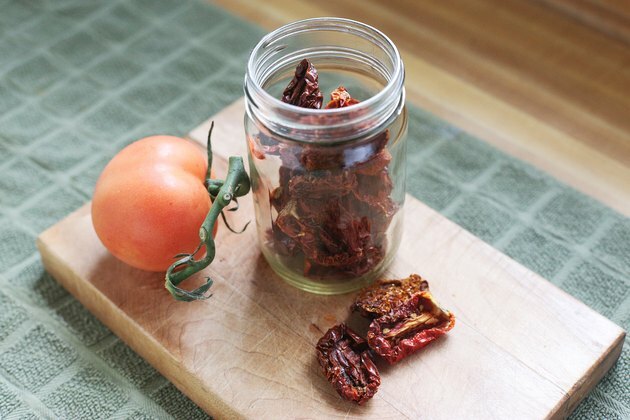 Sun-dried tomatoes come dehydrated, oil-packed and powdered, each with a different shelf life. Expiration and packing dates on the label give you the best indication of the shelf life of unopened sun-dried tomatoes. However, proper storage after you open them can keep the tomatoes fresh for up to 12 months. 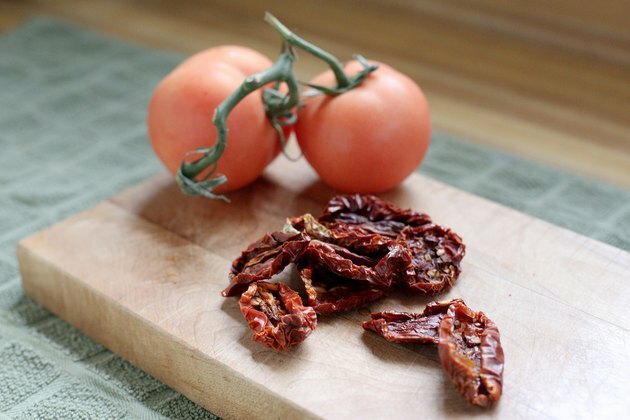 Although sun-dried tomatoes evoke images of tomatoes laid out on wood tables drying in sunlight, the artisinal approach isn't efficient for commercial purveyors. Sun-dried tomatoes you find in the store are harvested at their peak ripeness and dried with salt, wood-generated heat or dehydrators. All drying methods reduce the sugar content and concentrate the essence of the tomato into a piquant, tart product. They are either packaged and sold whole and in slices, or ground into a powder that gives soups and sauces an extra kick of tomato flavor without adding volume. 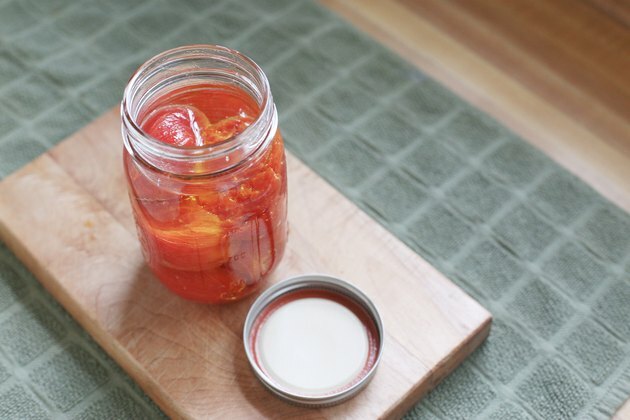 An unopened jar of whole or sliced tomatoes, preserved in olive oil, lasts 12 months from the time of packaging. Keep tightly lidded, opened jars refrigerated for anywhere from 6 to 12 months from their package date before discarding them. Keep the tomatoes fully covered in oil for maximum shelf life. Throw away any with a foul odor or discoloration. Unopened cellophane bags of dried tomatoes last up to 9 months in the refrigerator and jarred and powdered dried tomatoes last up to 24 months in the refrigerator. Freezing unopened packages extends their shelf life by several months. Opened sun-dried tomatoes and powder last up to 6 months in the refrigerator. Never consume sun-dried tomatoes that appear rancid or smell bad. 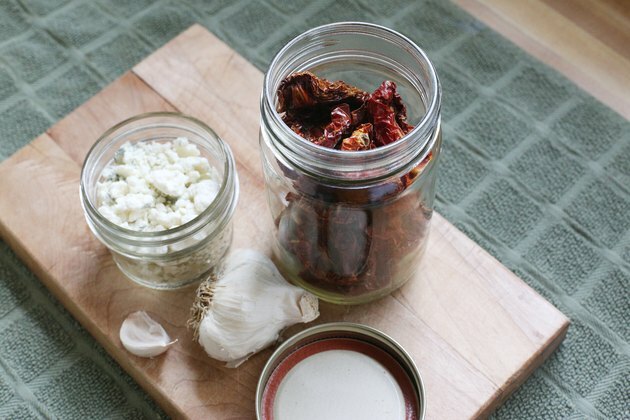 Proper storage maximizes the shelf life of sun-dried tomatoes. 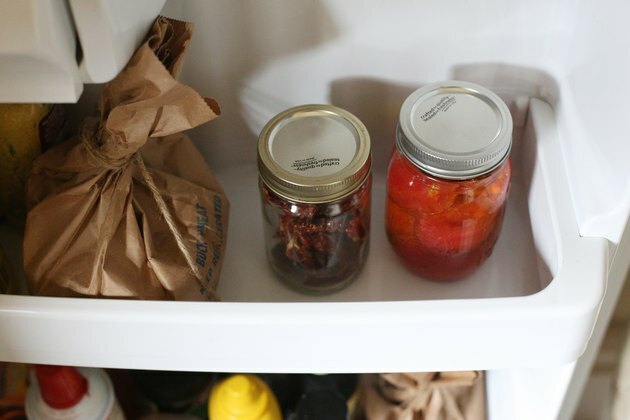 Always store sun-dried tomatoes and powder in the refrigerator. Sun-dried tomato powder normally gets packaged at temperatures below freezing. In air-tight packaging, the product warms to about 40 degrees Fahrenheit. Yet to preserve flavor and freshness, store it below 40 F with less than 65 percent humidity. Never keep opened sun-dried tomato packages near foods with strong odors, such as cheeses or garlic, because these odors can alter the natural flavor of the tomatoes.